The market continues to test and experiment with new frameworks and methodologies. The most notable are DevOps and agile, which are now widely adopted by many of the major IT service providers. Providers are implementing sweeping training and culture redevelopment programs to adopt best practices to support innovation and delivery in the application services space. Now more than ever, enterprises are looking for providers to help them rationalize and optimize their technology stack, of which business applications is a significant component. In their drive toward the Digital OneOffice, forward-thinking enterprises are engaging with providers that can build innovative solutions that can integrate and unite business applications and in the process break down business siloes. Given the importance of technology and business applications, enterprises are looking for collaborative partners that are invested in their success. As a result, we’re seeing an increasing reliance on existing relationships to deliver on fresh engagements. Service providers are also working tirelessly to ensure they are making the most of their talent—driving training and retraining programs to help keep employees’ skillsets up to speed in a changing market. Developing talent. Providers are working hard to develop talent internally through retraining programs and bring in the right people by building out innovative talent attraction processes. Building out partnerships. Providers are developing broader and deeper partnerships to support the increased demand from enterprises for a diverse and complex ecosystem. Blurring service lines. Traditional service lines, particularly infrastructure and applications, are coming under more pressure as enterprises show less willingness to differentiate between siloes when designing an engagement. Investment in capability. Many providers are building out their capability through acquisition of innovative start-ups and boutiques, as well as some major investments in the acquisition or merging of major providers and ISVs already operating in the space. "Are the partners who got us here the ones to take us to the next place?" This is always a tough question to answer, particularly in the application services space where the scope of projects is getting larger and encompassing far more technologies. To thrive in this market there is no perfect route – we see firms like IBM bolster capabilities through acquisition (RedHat being the largest), while firms such as DXC and Accenture pull in capability through partnerships, and the major IT outsourcers try to build up skills and talent organically. At its core, this is to meet the needs of an evolving buyer community that expects the best solutions from a complex array of technologies and practices. So, what we’re seeing is a large section of the provider community fight to stay relevant in a rapidly changing market. Honestly, we can expect to see some casualties, there’s just too much to specialise in for some providers to keep pace with, and many are spread too thin to become real specialists. The future in this space belongs to those who can keep layering valuable interfaces between a growing technology stack that includes advanced automation capabilities. For some, this will be through becoming a jack-of-all-trades, and for others, it will be through unique specialisms – all who are in between are vulnerable. Which of this bunch are going to break out of the pack, based on your recent conversations? As we’ve mentioned, there's a lot of movement across the leading service providers – but there are four or five that have a lot more going on than many of the others. Let’s start with IBM, which already has scale and differentiation in the space, but has jumped ahead of the pack in open source through the mammoth acquisition of RedHat. We also have Accenture which continues to be synonymous with innovation and bringing high-quality solutions to clients. The firm has also plugged in more digital design and apps agencies into its service lines in recent years, adding more brains and brawn to the rapidly growing market. It’s also worth highlighting Wipro, which has a strengthening reputation in the application services market – strengthened by the firm’s big bets in digital. This part of the IT services market has always been the core of Wipro’s business, so the firm is able to pull in experience and skills that other firms still need time to develop. We also have Infosys which, with fresh leadership, has started to take the services game seriously again. The firm has done a lot of work to retrain talent and redevelop its strategy. Jumping on the developing push for onshore and nearshore, Infosys is also building out delivery centres, particularly in the US with plans for more work in Europe. Finally, Capgemini and TCS are gaining ground. The former through capturing more mindshare in Europe for its IT Services heft and expertise – a potential gold mine as businesses grapple with geopolitical pressures and look to local technology experts to help them. And the Latter for pushing a fresh narrative on the need for technology in the modern enterprise through its Business 4.0 thought leadership. As a last note, HCL presents somewhat of a quandary to us since its purchase of IBM assets. It’s difficult to see the acquisition of somewhat legacy assets as a route to breaking out of the pack, but the reality is this could be a platform on to a broader customer base for HCL. All in all, though, we’re holding judgement until the firm has a clearer strategy for the assets. Are there any niche firms popping up who can disrupt this space? It’s a tough market for smaller firms to play in, but for specialists who can corner the market or disrupt business models, there’s plenty of room for manoeuvre. 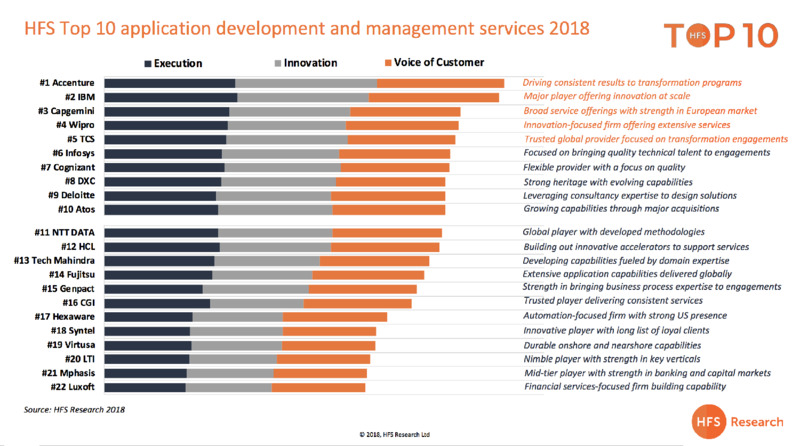 This is the first major IT Services analysis where we’ve included some of the mid-tier players where a lot of the innovation is taking place – simply because these firms have to try much harder to fend off the majors whether that’s the flexibility and agility of Mphasis or the vertical specialism of LTI. There are even smaller players starting to challenge in the space – nClouds, an HFS Hot Vendor is an excellent example of a small firm with a compelling track-record in the market, particularly when helping enterprises shift applications and services to the cloud. There’s a vast amount of space opening up for players in the ‘small and cool’ category – the acquisition of RedHat leaves behind a massive gap in independent open source and there is a large portion of the community disillusioned by the acquisition that could be a huge boon to the right company. And with several mid-tier players hoovered up by the majors – notably Syntel and Luxoft - there are gaps in the market waiting to be filled by agile firms. So, Ollie, which emerging apps services firms are worth keeping an eye out for? nClouds – In many ways, nClouds is the definition of a company thriving from the increasing blend of application and infrastructure. The firm leverages practices and technologies such as DevOps, Containerization, and public cloud to help clients evolve their technology stack. We were so impressed by client feedback from this firm that they made their way into the first HFS Hot Vendors at the start of 2018. Trianz – While not necessarily a niche player, Trianz has proven itself more than capable of taking on much larger firms to win deals. The firm has a broad range of services, but its edge seems to be the agility and flexibility it can bring to engagements. The firm has won multiple awards and seems to be benefiting from increased enterprise appetite to diversify engagements amongst many small players, rather than one giant one. Linium – (acquired by Ness Digital Engineering) – For specialisation, we need to look no further than Linium which has worked tirelessly to carve out chunks of the enterprise service management space. The firm has dedicated practices for core business platforms such as ServiceNow, as well as capabilities in custom application development. The firm was acquired by Ness Digital Engineering in 2018 – bringing with it broader capabilities and access to talent, as well as access to a broader pool of clients. GAVS Tech– When we covered Gavs Tech in our Q3 Hot Vendors, we concentrated on their zero-incident framework, an approach to reduce the impact of IT issues on end-users. But the firm has used the mantra across other service lines in the space, including a pay as you go DevOps models that focus on deploying reliable application code and resources. The DevOps platform provides an integrated solution for application development, testing, deployment, scaling and monitoring – not only offering improved speed and quality, but also a degree of simplicity in a complex technology environment. Simply put, the modern application services market is now so complex it’s not possible to be an expert in everything. Providers are beginning to recognize this and continue to bring in partners to support their delivery capabilities while retraining staff to move them into higher value work. At the center of this changing market lies a huge question mark around talent. Enterprises are telling us that there are major talent crunches in key areas of the market and for some applications, which is forcing them to push more work over to providers. The challenge is that many of these providers are facing similar challenges. All of the IT services providers assessed in this research have extensive retaining and retraining programs in place to ensure they get the most out of their teams. They’re also partnering up with major sources of talent, particularly higher education institutions. Nevertheless, the market is showing no signs of slowing down to allow providers any breathing space. Enterprise applications are now a major focus area for CIOs and technology leaders to get right. They need help writing off legacy, making sense of extensive technology estates, and finding areas of opportunity for new services and solutions.